My outfit that day was totally out of my comfort zone, I wore turban headband, off shoulder in red, leather pants with gold belt and I paired it with my favourite black clutch. Actually I feel like I was going to Coachella festival or Halloween party lol. After Ali Charisma, next fashion show presented by Selphie Bong. Selphie Bong is one of the youngest successful Indonesian fashion designer. She was the only Indonesian designer who was picked to be Haute Couture designer in the Year of Biodiversity in 2010 in Geneva by United Nations among with the other prime international designer such as Diane von Furstenberg, Reem Alasadi, John Rocha and many more. Her design was worn by many international speaker, and actresses. I love how feminine and elegant from Selphie Bong's collection. It's classic and you can see how the dresses made with the finest fabrication. Acakacak is the first label by LPTB Susan Budiharjo. 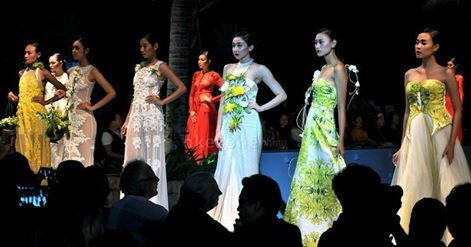 The fashion show case is designed by the school alumni. Acakacak present their colllection with the "Toys" theme. The collection was dominated with purple, white and green lime colour. There were cropped blouse, jacket, ponco, cullotes, and jumpsuit ready-to-wear accessories with unique hats and glasses. Acakacak successfully stole the show with their unique "Toys" concept and performance. Each of design has toys accessories in the clothes and their hats. Rendy Hapsanto is one of Indonesia's top fashion designer, whose design worn by many Indonesia's actresses. He also design wedding gowns, party dress and night gowns. Rendy Hapsanto's design was my favourite that night! I love his glamour designs, and all the dresses details was truly shown high fashion. Charlotte Chen is designer that I've been waiting for! I'm so curious about her famous goat leather bag. Charlotte Chen is Indonesia's top fashion and accessories designer, her design already spread all over top magazine in Indonesia, such as Female, Her World, Cosmopolitan, Jewelry, Lisa, etc. Her own label is "Charlotte" and she also has official webstore called Charlotte Chen Store. Last, but not least that day is fashion show case from Aftershock by Niken Gazayu. She is Indonesia's fashion designer graffiti. Her performance show Indonesia's culture and her design nuanced with ethnic and graffiti. She's so talented, especially with the graffiti mixed with her fashion. Two of her models stole the show with their body painting. I really enjoyed Bali Fashion Tendance 2016, I hope this event become an opportunity for Indonesia's talented designers to show their amazing designs to the world.